We are an inter-disciplinary team of researchers working in visual computing, in particular, computer graphics and computer vision. Current areas of focus include 3D and robotic vision, 3D printing and content creation, animation, AR/VR, geometric and image-based modelling, machine learning, natural phenomenon, and shape analysis. Our research works frequently appear in top venues such as SIGGRAPH, CVPR, and ICCV (we rank #13 in the world in terms of top publications in visual computing, as of 10/2017) and we collaborate widely with the industry and academia (e.g., Adobe Research, Google, MSRA, Princeton, Stanford, and Washington). 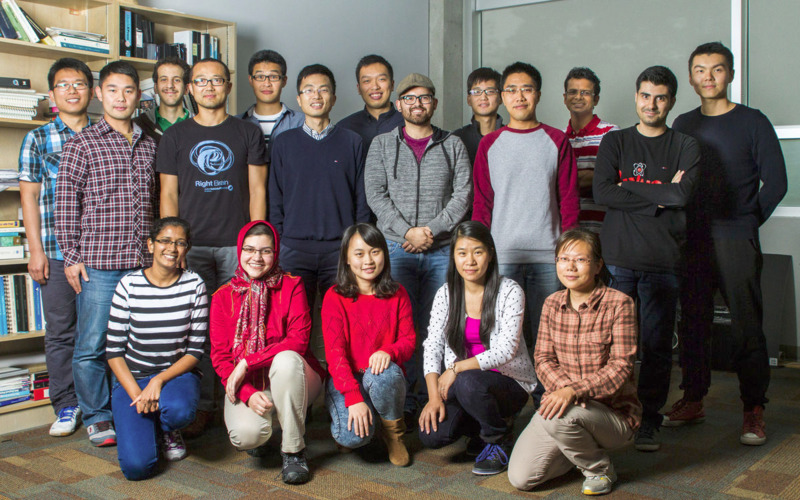 Our faculty and students have won numerous honours and awards, including FRSC, Alain Fournier Best Thesis Award, Google Faculty Award, TR35@Singapore, NSERC Discovery Accelerator, and six best paper awards from ECCV, SCA, SGP, etc. Gruvi alumni went on to take up faculty positions in Canada, the US, and Asia, while others now work at companies including Apple, EA, Facebook, Google, IBM, and Microsoft. The lab was first founded in 1992 by Professor Tom Calvert whose work in human animation led to the now famous LifeForms software and the startup firm Credo Inc. Today, we have a modern infrastructure, supported through two Canadian Foundation for Innovation (CFI) grants and two NSERC Research Tools and Instruments grants. Student support is provided by NSERC Discovery Grants, several NSERC Strategic Project Grants, along with funding from GRAND NCE, MITACS, and Precarn. Three GrUVi faculty have won the prestigious NSERC Discovery Accelerator grants.